USB3.0 DVD Drives — Standard USB3.0 High Speed transmission, support maximum 5.0Gbps data transfer rate, stable and fast. Downward compatible with USB2.0 and USB1.0. Easy to connect with desktop or laptop via USB interface. Slim ALUMINUM Alloy Design and Various Functions — You can watch DVD movies, listen CD music, copy music, pictures, movies to a CD/DVD, install software..ALUMINUM surface finish. High Compatibility — Compatible with Windows 98/SE/ME/2000/XP/VISTA/WIN7/WIN8, Mac OS8.6/10, Macbook Pro with OS 10.10.5, Macbook Air version 10.9.5, Surface Pro. Plug-and-play and Safe to Use — Come With one USB3.0 SATA cable, no external power and driver required. Support Compact Disc- It supports read CD,VCD,SVCD,CD-R,CD-RW,DVD-R/DVD-RW and burn CD-RW,CD+RW,DVD-RW,DVD+RW etc. GUARANTEES and 100% MONEY BACK — Risk free for 12 Months Limited Guarantee! ?Please contact Sonyabecca firstly once you have any questions. This Sonyabecca USB3.0 aluminum alloy DVD drive burner adopt anti-burning ring controlling chips, to supply you faster and safer data transmission. It is a perfect companion for computers without the internal drive. You can watch DVD movies, burn files and movies to a CD/DVD, install software and create backup discs etc. 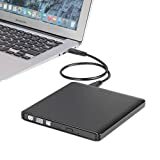 If you connect the DVD drive with front USB interface on desktop computer, and found DVD drive can not work normally, maybe the power is inadequate. You can try to plug USB cable of DVD drive into the back USB port of desktop computer, it will read the data and run smoothly. This drive is not fully compatible with computers of windows 10 system due to the compatibility issues between windows 10 itself and the external hardwares. This entry was posted in Computer Desktops and tagged 7/8/10, Aluminum, Apple, Black, Burner, Desktop, driveSonyabecca, External, Laptop, Notebook, Slim, USB3.0, Window, Writer by Express Computer Supplies. Bookmark the permalink.